The Thermo-Hygro-Anemometer PCE-THA 10 with compact size, new structure and integrated vane anemometer is equipped with a one-hand operation. 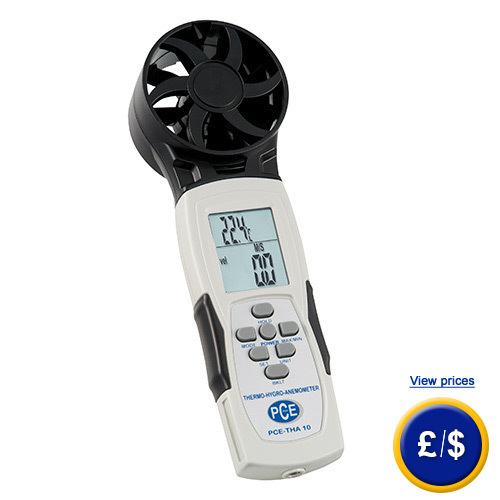 Next to the wind speed, the Thermo-Hygro-Anemometer measures the temperature, the humidity, the dew point, wet bulb temperature and the air volume. It is possible to save 5 areas. The average wind speed can be determined from the 20 storable points. Min and Max function. It is possible to record a measuring with the HOLD-function. The Thermo-Hygro-Anemometer is equipped with an easy to read, big display with switch able backlight and automatic cutoff. With the included software and USB cable, you can analyse the measurements at the computer. The Thermo-Hygro-Anemometer is ideal for heating, ventilation, and air-conditioning engineers or for sailors to measure the wind speed in a sailing tour. Here you can see an overview off all Anemometers. If you have further questions about the Thermo-Hygro-Anemometer, look at the following technical information, read the technical data or get in contact with us: UK customers +44(0) 23 809 870 30 / US customers +1-410-387-7703. Our technicians and engineers will inform you about our Thermo-Hygro-Anemoemter or any other product of in the field of Regulation and Control, Measuring Instruments or Scales and Balances of PCE Instruments Ltd.